CHASSIS: KTM engineers just love shedding weight. The result: the current KTM XC-W’s are the slimmest, lightest bikes in the Enduro scene. COOLING: KTM’s proven cooling system routes the coolant from the cylinder head through the frame triangle, directly to aluminum radiators made by WP. Thanks to flow optimized internal circulation and CFD-calculated ventilation, the system is superbly efficient. In addition,the radiator protectors improve heat dissipation. Especially in the mud. They are also integrated into the front part of the shrouds to protect the radiators in a crash. 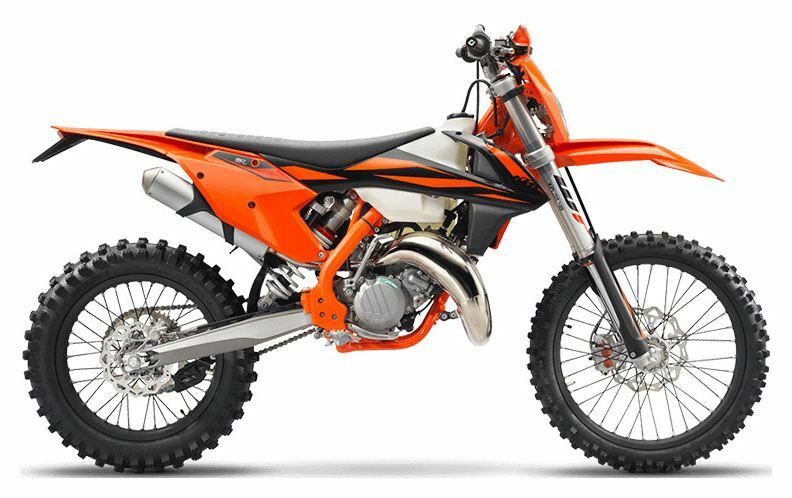 ENGINE & EXHAUST: The KTM 150 XC-W engine is the most powerful and most competitive engine in its class, providing precisely the kind of power an Enduro rider wants. This 150cc ripper has been developed with the latest KTM engineering know-how and the most advanced technology available. The results: whopping power and mountain conquering torque across the entire rev range, while being extremely compact and light. CYLINDER: This compact cylinder with a 58 mm bore features a cutting-edge power valve unit with a sophisticated mechanism for the lateral support exhaust ports. Matched to a twin-component cylinder head, it is KTM’s secret to all-round grunt. The layout of the cylinder and head water jackets guarantee efficient heat dissipation when you’re riding at your limit. CRANKCASES AND ENGINE COVERS: Lightweight, die-cast crankcases featuring a high crankshaft and clutch shaft position, located close to the center of gravity, which results in optimal mass centralization and outstanding rideability. In addition, the engine body is extremely lightweight and compact, while still able to house an E-starter. And because looks matter, the engine covers feature an advanced surface structure in order to reduce the wear caused by the rider´s boots. CARBURETOR: The KTM 150 XC-W is fitted with a MIKUNI TMX carburetor. This 38mm flat slide carb lives to provide smooth and controllable power all the way up to the rev limitation. EXHAUST: The engineers meticulously tuned the pipe for maximum power, so this little screamer is as tough as it is strong. AIRBOX: The air filter box design offers maximum protection of the air filter against soiling, while ensuring maximum airflow in a quiet way. The large Twin Air filter is mounted in a stiff cage, which at the same time holds the system in place. This design is so simple, you could still pop a fresh one in with a face full of mud. Without tools. In seconds. BATTERY & WIRING HARNESS: These engines are fitted with KTM’s proven E-starter – a unique KTM feature and a major benefit at all levels of offroad racing. A super compact lithium ion battery breathes life into the engine, while offering three times the starting energy of a conventional battery. The battery and wiring harness are centralized in a compartment above the air filter box, allowing the mechanic to remove the subframe without getting in conflict with the electrics. A happy mechanic, is a good mechanic. FRONT SUSPENSION: The WP XPlor 48 upside-down fork is a split fork developed by WP in close collaboration with KTM. It is fitted with a spring on both sides but features separated functions for each fork leg: compression damping is fitted on the left side, while rebound is on the right. The forks can easily be adjusted for compression and rebound with the twist of a dial on the top of the forks. In addition, a sealed hydro-stop guarantees excellent resistance to bottoming-out. Due to high-quality materials and a state-of-the-art production process, the WP XPlor 48 fork – with approx. 300mm of travel – has outstanding response and damping characteristics. A comfortable preload adjuster can be retrofitted and allows for a simple spring preload setting in three steps without tools (standard, +3mm, +6mm). Front - WP XPlor 48 upside-down fork; travel - 12 in.